This is a guest article by Flexo from Consumerism Commentary. Flexo is currently on a ten-day, ten-venue tour. Please do not be cynical. I hate cynicism. For the record, it’s my least favorite quality. It doesn’t lead anywhere. Nobody in life gets exactly what they thought they were going to get, but if you work really hard, and you’re kind, amazing things will happen. I’m telling you, amazing things will happen. Though I’m not generally a fan of “late night TV,” I tuned in the other night and found myself watching Conan O’Brien’s last stint on the Tonight Show. As he signed off, and before he picked up a guitar to perform Freebird with Will Ferrell and Max Weinberg, those were the heartfelt words he spoke as advice to the millions of people in his audience. It was a classy exit if there ever was one. Perhaps his comments refer to Conan’s publicized attempt to negotiate better severance benefits for his staff. NBC subsequently claimed, cynically, that Conan’s “niceness” was more of a public relations stunt than genuine concern for the crew and talent, although Conan is supplementing his staff’s severance with over one million dollars from his own severance deal. 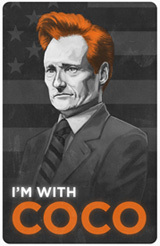 Say what you want about Conan O’Brien’s comedy act, whose biggest bits are a cigar-smoking dog-puppet and a masturbating bear, but his career momentum led him to helm the Tonight Show, the holy grail of television entertainment, with 700,000 fans of the “I’m With COCO” movement on Facebook. So it’s worthwhile to listen to his advice. There’s no way of getting around this. Success at anything requires significant effort regardless of the goal. If you want to get out of debt, it’s not going to happen if you keep your same spending habits and don’t come up with ways to earn more money. If you want to own a prominent business, you’re not going to get there with only two hours a few days a week. To achieve greatness in any field, you must have the dedication to make it happen by directing your energy and effort towards greatness relentlessly. “Nobody in life gets exactly what they thought they were going to get.” Unfortunately, no one person can control everything about their own lives, so sometimes we have to deal with unexpected problems, like being fired from the biggest late night television program. But also, as someone works hard on the path to success, it’s possible to discover something new, something that redirects us onto a new path. That change should be embraced, not feared. Books and seminars focusing on success often forget the power of using kindness to recruit people as fans and supporters to your cause. It’s true that nobody cares about your success as much as you do, so you must start from the position that no one is going to help you achieve your dreams. There are two paths you can take once you start. The first option is to focus solely on yourself, be ruthless on your path to the top, and take every advantage given to you even if it is in the expense of others. After all, who knows when you might get another opportunity. The second path is to be an advocate for other people, use your rising prominence or expertise to support their dreams, and spend some effort on external issues. Karma is real, whether it’s some kind of universal force or just an observation of human behavior. Being kind and supportive increases the possibility that the world will be kind to you and supportive of you. And although no one else will help you succeed and the hard work won’t go away, you’ll find it’s easier when the community’s on your side. Conan O’Brien has been forced out of his position as the King of Late Night Television Comedy, no longer sitting on the throne of the Tonight Show. Where does someone go once they’ve reached the pinnacle of their career? They can’t go back to mediocrity — the choices are generally retirement or death. Is this where hard work and kindness will lead, being pushed out of the best job in entertainment in favor of a comedian whose most popular skit mocks the stupidity of random people on the street? As far as setbacks go, this is major. But in the face of any negative force, focus on what can be done to make the situation positive. This is not about media spin or convincing others what you want them to believe, it is an actual mindset. Take Conan’s advice now. Work really hard, be kind, and don’t be cynical. Even if you don’t have an ultimate goal of being the best in the world, this is a sound philosophy for making the most of your time on this planet, being a positive force in the world around you, and cultivating success for yourself. For those who missed it, here is Conan O’Brien’s final thoughts about NBC, his audience, and what it takes to succeed. Previous post: The $20 Discount that Shouldn’t Have Been.